Power through your scratch-off lottery tickets and find your way to a winner with this lottery scratcher keychain. 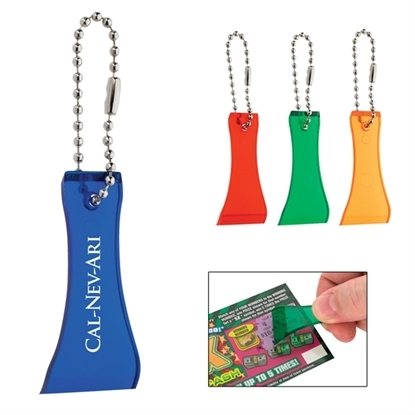 This handy promotional tool is perfect for any scratch style ticket and measures 2"W x 7/8"H. It comes complete with a bead chain that makes it easy to include on keychains, bags, backpacks and more. Add a custom imprint of your organization's name, logo and advertising message and create the perfect tool for any regular lottery player! Mypromotionalpens.com offers the largest and best priced selection in Promotional Scrapers. We will price compete and we won't be under sold. Let our graphic designers make your personalized Scrapers standout above the crowd at no charge. We won't stop until you are completely satisfied with your custom Scrapers art proof.Use category search filters on your left to help narrow your search to find exactly what you are looking for.